This is a GUI program built in Visual Studio 2013 using the C# programming language that takes many ADB and Fastboot commands and puts them into an easy to use toolkit that supports a ton of Android devices. It's goal is to simplify the process of unlocking a device's bootloader, flashing a custom recovery and gaining root for the newbies of the Android world. If you find it helpful, give me a thanks and a donation if you can. If you find a bug or have a feature request, feel free to leave a reply. Thanks, and happy rooting! Check out this spreadsheet for a list currently supported devices. Open the WinDroid Universal Android Toolkit. Download and install the ADB drivers if it prompts you to. Choose your device from the list. Wait a few moments while it downloads the correct recoveries. Turn on your device, go to Settings > Developer Options and Enable USB Debugging and plug it in. If the toolkit does not recognize your device immediately, click on the Refresh button in the bottom right corner. - If you are on Android 4.2.2 or above, and you do not see a button for Developer Options, you will need to go to Settings > About > Software Information > More and quickly tap on Build number multiple times until it tells you that Developer Options has been unlocked. Move to the next box on the right named Flash A Recovery You now have two methods available to flash a recovery. - You are given different options for recoveries depending on your chosen device. Please choose the correct device variant. This means that if there is more than one recovery option, match the one that corresponds with your carrier/model/country, etc. If you are not sure which option you should choose, please research some more or ask in this thread before you move on. 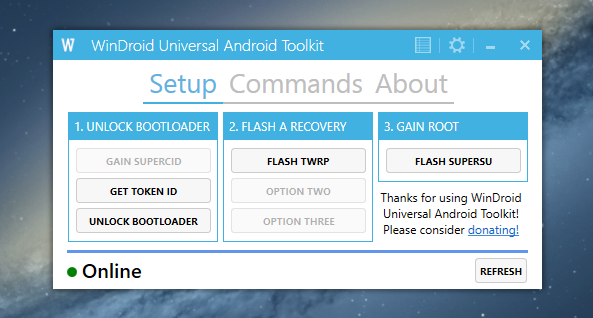 - Once you have made your choice, click on the Flash TWRP button for the correct variant. Your device will then reboot into bootloader and flash your chosen recovery. - If you are having any issues with the automatic method, such as missing recoveries, you can download them manually here. Find the folder that matches the name of your device, then download all the recoveries within the folder. Then, move those files into the folder named Recoveries within the Data folder created by the toolkit. Finally, you can proceed with the instructions given for the Automatic Method. (If your device has only one variant, the file should be named Recovery.img. If it has two or more variants, the files should be named Recovery1.img, Recovery2.img and Recovery3.img). You are now rocking a custom recovery! You can now proceed to gain permanent root. Move to the next box on the right named Gain Root. Click on the button named Flash SuperSU and select Yes. SuperSU will now begin to download. Once it finishes, SuperSU will be pushed to your device and your device will be rebooted into recovery. Once your device has booted into recovery (TWRP), tap on Install in the top right corner. Then, scroll until your find SuperSU.zip. Tap on it, and swipe to confirm flash. Congratulations, you are now fully rooted! - I am in no way responsible for any harm, damage, nuclear fission or bee infestation that may occur to your device through the use of this toolkit. - Please do not post, mirror, or take credit for this toolkit or any related work without explicit permission.